Photo Courtesy of RamseyCorp.com, DaimlerChrysler LLC. I was awoken early this morning with the prospect of meeting my father for breakfast at a local joint, something that we’ve done once every year or so since my parents got divorced. I waited in the parking lot for once hour, expecting to see his clattering old 1998 Ram pull into the lot at any point. 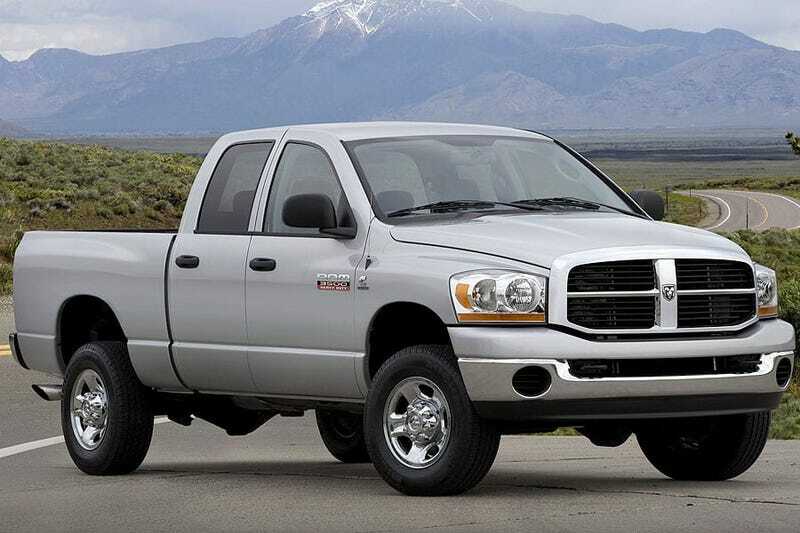 However, my dad walked up to the car with no sign of the Ram, and that’s when I noticed he pulled up in something about ten years newer than that: a mid-2000s Ram 2500 with the Cummins turbodiesel. After he showed me around, he asked, “Do you want to drive it?” I usually stay away from giant trucks, but sometimes you gotta do things for the Oppo review. It’s a truck, so you have to remember that it’s not exactly going to make waves in the design world. Even with that said, these third-generation Rams are not the best-looking trucks out there, not even the best-looking Rams. And to make matters worse, this one is the god-awful 2006 redesign which I’ve never really liked. But I will add some pity points back for the fact that it is only a truck, and utilitarian-wise, it gets the job done. Photo courtesy of vehiclehistory.com, DaimlerChrysler LLC. It’s really tough to perfectly describe the issue with quality in mid-2000s Daimler Chrysler, but the best way I can describe it is, “PlaySkool.” Everyone gives GM and Ford a tough time for dodgy interiors then, but no one did it worse than Daimler Chrysler. Somehow, though, I can’t really deduct much points from this truck on that matter. With it being a base model truck, it doesn’t try to hide its quality issues with cheap leather and plastic wood. But I can deduct major points for its massive blind spots and nearly-ineffective mirrors. I felt like I was driving a big, fat jail cell that was going to run over someone. Not a very reassuring drive. Photo courtesy of The Car Company. This particular Ram is a much more loaded example compared to the one I drove. There’s not much you can say about a base-model truck when it comes to this area. This truck didn’t even have power windows or locks, no special niceties at all. The only thing you get is an aftermarket alarm (how that works with no power locks, I have no idea). One benefit it does have is the interior is a very comfortable place. The seats were relatively soft and you have some decent room to stretch out in the front. I know these trucks had a “MegaCab” option which gave back-seat passengers nearly limo-like space too, unfortunately this was not one so I couldn’t tell you if that helps or hurts. It’s a mixed bag, honestly. Once again, it’s a truck, so I have to go easy on it. But we at Oppo like to flog and hoon things, so I’m going to have to keep that mentality. This truck is not a fast truck. I’m not really sure what engine it has, if it’s a 2007 it could be a 6.7 with 350 hp and 650 lb ft of torque. Those big numbers are impressive, but transfer to nothing but ground-pounding towing capability when you stomp on the pedal. Once again, though, it wasn’t built for this, just as much as it wasn’t built for corner carving. Thank god, too, as the light and numb steering only barely manages to make it easy to navigate this humongous thing around a town. Definitely no BMW, that’s for sure. Photo Courtesy of K&N Filters. I’d say the value on these slightly used trucks is pretty fair, especially compared to the new market for similar vehicles. The entire reason my dad bought one of this age rather than a new one is purely for that reason: $13-17 grand is better than blowing nearly the price of a house on a new Ram 3500. The prices of its competitors all seem to stay around that area depending on condition, so honestly at that point it’s down to personal preference. Rough numbers to some, but this truck was never meant to break records. It was built to work, and that’s what it does best. It should also be noted, that I’m not a truck reviewer though. That all being said, it’s got its good points and its bad points, but if you’re in the market, I’d recommend checking one out. You might have a different thought process than I.